Most of you that read this blog know that I co-host the Packet Pushers podcast, which just celebrated its 5th anniversary. Packet Pushers is my full-time job now, and one of the things I get to work on as a result is more content. 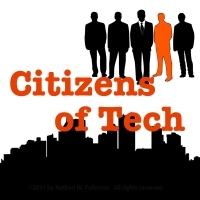 One idea I’ve created with my friend and fellow technology nerd Eric Sutphen is a technology show we’ve entitled Citizens of Tech. The idea behind CoT is to talk about anything tech-related that’s interesting to us. We figure if it’s interesting to us, there’s a good chance it will be interesting to you. So, CoT is not a show about gadgets and apps, at least not specifically. It’s not a show about networking. It’s not a constipated show about IT. Rather, it’s a show for nerds who like science, gaming, books, contrarian thinking, entertainment, space exploration, transportation, energy, complex world problems, and anything else that’s somehow technology-related. Sure, that might include gadgets, apps, IT, and so on, but we’re trying to appeal to a certain kind of mind — probably yours — and not a certain kind of industry. We’ve published 3 shows so far, all in the Packet Pushers Community Podcast channel, where we incubate new show ideas and budding podcast talent. We think we’ll give the show its own channel if we keep getting positive feedback. So far, so good. The best way to send love to CoT is following and tweeting at @citizensoftech. Also follow @zutfen and @ecbanks to keep up with the two hosts. You might also leave a comment on the blog posts for each show to let us know how we’re doing. This sounds great! I will check it out today!